The space below stairs in homes is often left underutilized by designers and builders. This area in the home is actually a great resource to gain a few more square feet of functional space in your home. 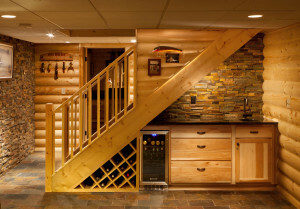 The more common but “boring” use of this space includes coat closets and pantries or even a small bath or laundry room; however, I’ve come across some really great projects and found several more unique applications for utilizing space underneath stairs. Brillo Home Improvements Inc. in Milwaukee, Wisc., completed a basement level renovation and used this space to create a custom wet bar. The bar comes with built-in wine rack, beverage refrigerator, sink, and puck lights underneath the staircase. A stacked stone veneer backsplash completed this niche. Before renovation, this space was concealed with dated side paneling and the room felt more like a dungeon. This transformation was amazing and NARI thought so too. The National Association of the Remodeling Industry presented Brillo with a gold award for this project in 2012. Before Brillo’s renovation, staircase space was hidden and concealed with dated paneling. Meanwhile Toronto-based Sage Design Studio in Toronto carved out a study niche under the staircase shown here. There was plenty of space to create an ample built-in work surface with drawers for storage below as well as open shelving above – a great place to store invoices, statements and other important records in the magazine file boxes shown here. This built-in office niche was a fabulous bonus that wasn’t part of the initial plan. Last but not least I’ve seen several designers use this space to create pet caves or playhouses for the children in the home. If you’ve been pondering a renovation for your home, the internet can be a great resource for ideas to come up with your own unique way to utilize otherwise dead zones in your home. Projects like these can be found on HOUZZ.COM, PINTEREST, and other inspirational home décor sites online.